This is the best compact car for you if you covet the Corolla formula of reliability and value but fancy it in a sleeker, sportier form. 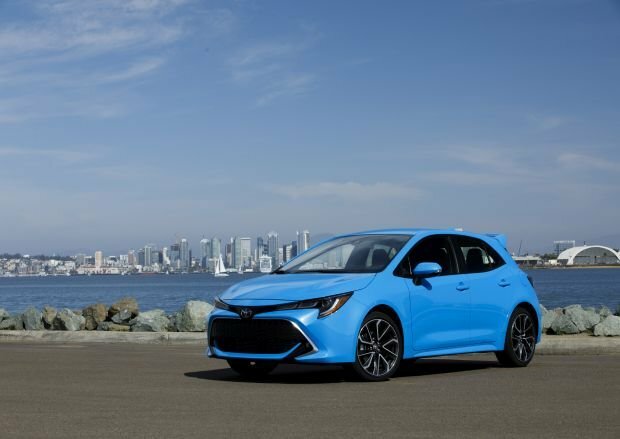 This front-wheel-drive four-door hatchback is an all-new design and one of the first Toyotas with the brand’s updated safety and infotainment suites. The Corolla Hatchback essentially replaces the Corolla iM hatchback, which was a migrant from Toyota’s now-discontinued Scion brand. Its underskin engineering – a version of the company’s Toyota New Global Architecture (TNGA) — will be used for the redesigned 2020 Corolla four-door sedan. It looks racier than it drives but does demonstrate the Japanese automaker’s commitment to cars even as crossovers, SUVs, and pickup trucks grow to account for 70 percent of new vehicle sales. Competition includes the Volkswagen Golf and hatchback versions of the Subaru Impreza, Hyundai Elantra, Kia Forte, Mazda 3, and Honda Civic. However, with one engine – a 168-horsepower four-cylinder – the Corolla Hatchback lacks the performance of turbocharged 200-plus-horsepower rivals such as the Golf GTI and Elantra GT. Though nowhere near as popular as its sedan counterpart, the hatchback version of the Corolla, in both its redesigned form and as the iM, did well in the marketplace in 2018. Sales were up 11 percent in contrast to the nearly 14-percent drop for compact cars as a class. Indeed, in a telling sign of the times, Chevrolet has announced it will discontinue its compact Cruze, Ford its Focus, and VW its Beetle. Buy a 2019. Toyota won’t update the 2020 Corolla Hatchback enough to make it worth waiting for, but it’s almost certain to increase the price. Expect the model lineup to repeat SE and XSE trims, with an outside chance Toyota might launch a de-contented LE grade at a lower price point. Like the SE and XSE, it would come with a handling-tuned suspension and share a four-cylinder engine with a choice of manual or automatic transmission. Styling: Toyota gives the Corolla Hatchback a smoother look than its iM predecessor. Gone, thankfully, are the odd angles at the corners of the body. Sharply raked headlights remain but they fit much better into the fascia. If not entirely original, the overall design is eye-catching if for no other reason than it’s from normally staid Toyota. The interior follows Toyota tradition with a logical control layout; high-quality, soft-touch materials; and nicely padded seats. Oddly, the SE and XSE have distinct instrument panels. Both gauge clusters include a multi-information display, 4.2 inches for the SE and a generous 7 inches for the XSE. We prefer the SE’s, however, because it places the display to the side of the main gauges rather than directly in front of the driver. We think this helps minimize distractions. Both place an 8-inch infotainment touchscreen high on their central dashboard, tablet style. 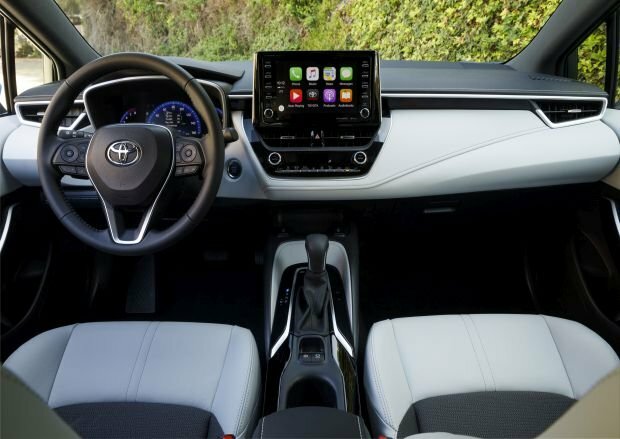 It hosts Toyota’s Entune 3.0 interface and support for Apple CarPlay. Google’s Android Auto is not available, although the company promises to add it via a software update at an as-yet undetermined point. Imbedded GPS navigation is available on XSE models equipped with the optional continuously variable automatic transmission. Compared with the iM, the Corolla Hatchback is 1.5 inches longer in wheelbase (the distance between the front and rear axles) and 0.6 inches wider. It’s shorter by 0.6 inches in overall length and 0.4 inches in height. Comfort is fine up front, with class-adequate headroom and legroom. Despite the stretch in wheelbase, however, the back seat is very tight for legroom, and the slope of the roof cramps noggins. Cargo volume is listed at 18 cubic feet behind the rear seats, but wheel-well intrusion and a lack of height limit the size of objects that can be carried without folding the seatbacks. Interior storage is fine, with a decently sized glovebox and door pockets. There’s an angled cutout below the climate control panel that we suspect is for a smartphone. However, our iPhone 7 Plus with slim case barely fit on its own and not at all with a USB cable connected. Further, the primary USB port that allows access to CarPlay is in an awkward position that makes it difficult to reconnect without either fumbling blindly or contorting your body to find its exact position. Mechanical: The TNGA platform also underpins the company’s larger Avalon and Camry sedans, as well as its Prius hybrid. 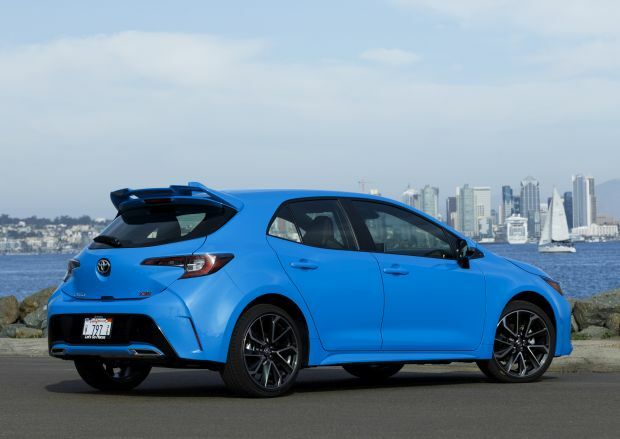 It’s a sturdy design and Toyota fits the Corolla Hatchback with an astutely tuned suspension. The 16-inch wheels and tires standard on our SE test model contributed to a ride that is surprisingly smooth, very stable, and absent almost all road noise. Grip in turns is decent, though the steering disappoints with next to no road feel. XSE grades use 18-inch tires. Perhaps they have more responsive steering, but no examples have been available for us to evaluate. Both trim levels share a non-turbocharged 2.0-liter four-cylinder with 168 horsepower and 151 pound-feet of torque. Standard on both is a six-speed manual transmission. A continuously variable automatic transmission (CVT) that includes a throttle-quickening sport mode and steering-wheel paddles is available as a $1,100 option. The paddles offer 10 virtual gears to make the CVT feel more like a conventional automatic. It also has a “launch gear” designed to improve off-the-line acceleration. The problem, though, is that the engine doesn’t reach peak horsepower and torque until 6,600 and 4,800 rpm, respectively, so it still takes a couple car lengths for the Corolla hatch to feel like it’s really moving. Further, the acceleration process is not very pleasant to the ears. Thankfully, the engine settles down once you reach cruising speeds. Features: All Corolla Hatchback models are well equipped. This is one of the first Toyota vehicles to come with the company’s “Safety Sense 2.0” (TSS 2.0), which is a suite of driver assistance features. Item such as automatic high-beam headlights, adaptive radar cruise control, autonomous emergency braking with pedestrian detection, and lane-departure alert are standard across the board, even on models with manual transmission. Also standard are road-sign detection, while CVT-equipped models also get Toyota’s Lane Tracing Assist (LTA), which works in conjunction with the radar cruise and lane-departure systems to help keep the car centered on the highway. During our evaluation, LTA worked inconsistently. Sometimes it kept our test car perfectly centered, while other times it tended to push the car toward the inside part of the lane. We disabled this feature for most of our review period. Other features included on the SE are the usual array of power accessories, cloth upholstery, single-zone automatic climate control, Entune 3.0 with CarPlay and Amazon Alexa, and full LED headlights. XSE upgrades include, 18-inch wheels, LED fog lights, cloth/leather upholstery with heated front seats, power driver’s seat, dual-zone automatic climate control, satellite radio, and Toyota’s Service and Remote Connect telematics. Steering-linked headlights and blind-spot alert with rear cross-traffic detection are standard on models equipped with the CVT. Pricing is competitive with compact hatchbacks of similar power, and base prices listed here include Toyota’s $920 destination fee. SE grades start at $20,910 with manual transmission and $22,010 with the CVT. The XSE manual has a base price of $23,910 while the CVT version is $25,010. The SE CVT offers a $1,400 Preferred Package that includes blind-spot alert with rear cross-traffic detection and the XSE’s upgraded infotainment system. Steering-linked headlights are $415 option on the manual-transmission XSE. The XSE CVT has its own $1,600 Preferred Package that adds imbedded navigation, 800-watt 8-speaker audio system, and wireless smartphone charging. Any version of the SE is our pick for best value. It’s not the most fun-to-drive small hatchback available, but it offers a lot of bang for your buck, especially with the manual transmission. EPA ratings are quite good, especially with the CVT. Manual models rate 28/37/31 mpg city/highway/combined. The SE CVT rates 32/42/36 mpg. Due to its lower-profile tires, the CSE CVT’s ratings are slightly lower at 30/38/33. Our SE CVT review sample returned an outstanding 43.5 mpg in our suburban test loop. Corolla Hatchback uses regular-grade 87-octne gasoline. Don’t expect many significant changes to this car in the short term. The only thing we might see is the introduction of a lower-cost model that could perhaps carry a sticker price of less than $20,000. Despite an increase in sales, the Corolla Hatchback is still a drop in the bucket of Toyota’s overall sales. The Corolla sedan outsells it by nearly 10 to one. Any notable styling or content updates for the hatch are otherwise unlikely before model-year 2022.